Food brings people together. That simple idea is what underpins Something to Share, a cookbook produced in 2018 by Refugee Action—Colchester, a small but mighty voluntary organisation that works to help newcomers settle into the town, access services, and feel at home. There is, of course, a broad base of research demonstrating that cookbooks shape notions of belonging and community, from the local to the national—and all the more so for social justice groups seeking to promote inclusion and fund their work. 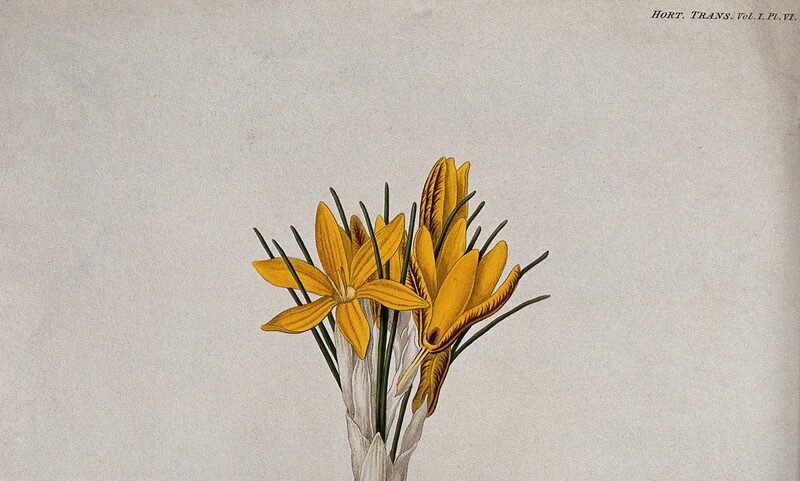 When we set out to produce Something to Share, however, what interested us was what we had seen in action ourselves. 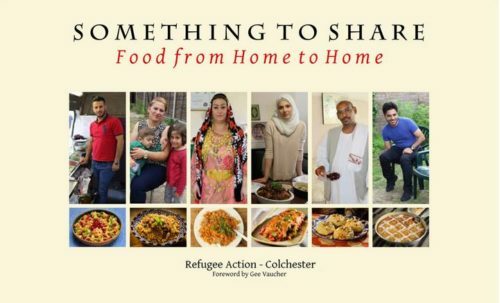 Refugee Action—Colchester’s cookbook, Something to Share, is available to order online. Thanks to generous support from Linklaters LLP, all proceeds in their entirety go to support RA–C’s work and clients. The cookbook would also not be possible without support from Firstsite. Since 2016, RA–C has operated the Syrian Pop-Up Café, which sees local refugees catering for community groups, churches, colleges, weddings and birthdays, the University of Essex, the Roman River Music Festival, and local arts venue Firstsite. The first café took place at the opening of Gee Vaucher’s Introspective exhibition at Firstsite, and Gee later came on board to design our cookbook. We now run regular cafés and cookery classes, with the goal that these will become self-supporting and refugee-run enterprises. Food and recipes have thus helped RA–C to build bridges of all kinds, and they have been a catalyst for integration, solidarity, and togetherness for our refugee chefs. We hope that Something to Share makes a meaningful contribution to how Colchester sees itself as a welcoming and multicultural town. This book brings together family recipes from local refugees, asylum-seekers, and volunteers, placing them alongside personal stories of memories connected to food, long and difficult journeys, and the building of new homes and friendships. It presents an image of Colchester as a place with a long history of welcome and the courage not to look away from those in need. Below, you will find an excerpt from the book where two of RA–C’s founders, Maria Wilby and Iman Mortagy, reflect on how food and recipes underpin everything they do. Maria: Everyone says the kitchen is the heart of the home, meaning what gets created in the kitchen. Food nourishes people, and not just physically. I think it’s a really important element of what we do at Refugee Action—Colchester. Iman: Cooking and the kitchen are important to me too as part of my spiritual journey on the Sufi path. […] I think others may relate to this too. In the tradition and writings of Rumi, seekers need to be ‘cooked’ themselves in order to be matured into purer and tastier beings! […] In Sufism, there’s an emphasis on being very present in anything we do, treating it like a meditation, with reverence. The idea is that the cook transfers her or his energy into the food that’s being cooked. In fact, Rahaf [whose recipes appear in the book] tells me that her mother also does a prayer while she’s cooking, the same one that I do while stirring the pot. She will silently chant Ya Wadud (literally, ‘Oh Source of Love’). It’s all about love really, isn’t it? Interestingly, many people have commented that the food at the Syrian Pop-Up Cafe is very good because it’s made with love. Maria: It’s similar to British culture where, traditionally, families used to say prayers before meals. I noticed with the Syrian community that there is a deeper reverence for the food and an absolute understanding of what they’re cooking and how flavours work together. There are regional variations in their recipes that I realise personalise their dishes. Iman: When you’re preparing a meal in the Middle East, it’s about honouring the guest. For thousands of years, one of the most important values in Middle Eastern culture has been generosity. There are so many proverbs and poems that tell you to bring everything out of the cupboard for your guests. What I present to you on the table is a testament to what you are worth to me. Iman: I think we all bring our own backgrounds and experiences to the table when we’re making food for the Pop-Up Café. Jen Bagelman, Maria Astrid Nunez Silva, and Carly Bagelman, “Cookbooks: A Tool for Engaged Research,” GeoHumanities 3, 2 (2017): 371–372; Sidney W. Mintz. Tasting food, tasting freedom: Excursions into eating, culture, and the past (Boston: Beacon Press, 1996); Priscilla Pankhurst Ferguson. Word of mouth: What we talk about when we talk about food (Berkeley, CA: University of California Press, 2014).